Japanese skulk v. Marine attackers on half of board 36. An ad-hoc collection of US infantry, armor and AT guns tries to defend the Hotton Bridge v. first-line German infantry, halftracks and Panthers. Boards 16 & 40. Shermans with 76L guns and infantry take on PzIVHs and a small infantry force on board 17. Mud makes this a tight one. Brits attack besieged Germans on a hilltop in Italy. Lots of bloody action on boards 39 & 42. 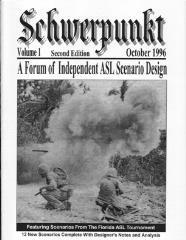 One of the most popular and well-balanced scenarios in the first Schwerpunkt packs. Half of board 42 sees combined-arms forces of US and German OBs battle it out for possession of a small hamlet. One of the "Guripa" series, following the Spanish 250th Division de Infanteria in its exploits in Russia. This micro-scenario is extremely well-balanced and can be played in under an hour! Half of boards 7 & 18. British Commandos storm into a small villiage, only to find it well-defended by a small but well-hidden force of SS and assault guns. Board 42. Germans try to overtake fleeing Russian units on boards 34 & 37. Brits in Burma take heavy punishment as they cross open ground to attack Japanese in a bannana plantaition. Board 33. Early war action pits a company of the Dorsetshires against a typical Panzer blitz. Half of boards 10 & 19. A suprise encounter on board 41 between Tiger IIs and late-model Stalin tanks in Northern Germany late in the war. American airborne attack a mixed force of Italians and Germans in heavily-defended pillboxes on board 11.